The next page in the Guide is s supplemental page that was stuck in the inside cover along with the letter to the dealers. 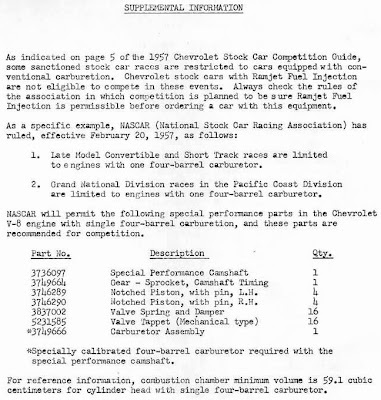 This supplemental page was put into the Guide after the '57 Chevys dominated the 1957 Daytona Beach race while using their fuel injection units. 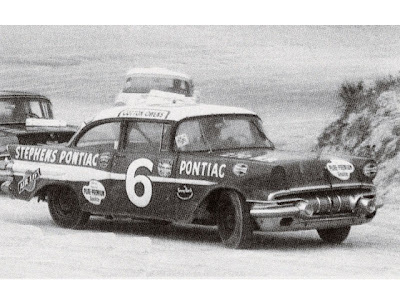 Although it wasn't a 'fuelie' that won the race - it was Cotton Owens in a Pontiac (see picture below and note the 57 Chevy behind him) - NASCAR still banned the use of fuel injection on any of their race cars, a ban that continues even today. 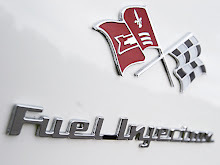 This supplement clearly lists what parts (with part #'s) that were needed to convert the 'fuelie' engine into a single 4-barrel carburetor one that would meet the rules requirements of various racing governing bodies such as NASCAR. End of Part 2 ... look for Part 3 soon!